Soul vocal group from Houston, Texas. Active from 1967 to 1980. They released three albums at Atlantic and four at Philadelphia International Records. Archie Bell formed the group while at high school and after their first local hit at Houston, "Tighten Up", Atlantic offered them a contract, in 1967. Initially the line up consisted of James Wise (2), Willie Pernell, L.C. Watts, Cornelius Fuller. In 1969 they started a succesful carrer at Philadelphia International Records. 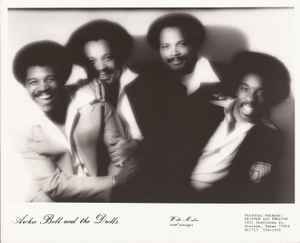 After breaking up, Archie Bell released a solo album at Becket Records. The group went on performing. During the 1990s the line-up included Steve "Stevie G." Guettler (guitar, vocals), Jeff "JT" Strickler (bass guitar, vocals), Steve Farrell (guitar, vocals), Mike Wilson (keyboards, vocals) and Wes Armstrong (drums, vocals). Jlrake, the bio's are created by well meaning members just like yourself. While these guys did have a single released on East-West (#2048 from 1968) titled She's My Woman, there is also an older pressing of Tighten Up from 1967. It was released on the Ovide label, Cat # 228. This pressing is VERY hard to find so it's no surprise that one has not been listed yet either. It was reissued by Atlantic as Cat # 2478 Dog Eat Dog / Tighten Up which is the exact same Cat # as Tighten Up. They were on Atlantic until 1973 when they did a few titles on Glades before moving over to TSOL/ Philadelphia International. There were a couple other 1 of labels in the early 80's as well. Who edits the bio' blurbs here?! It says above that the group moved to Philadelphia International Records in 1969, but the very discography above testifies to their not having released anything on a label other than Atlantic until '75! Also, earlier today I heard on a syndicated '60s oldies&rarities radio show a single of hteirs pre-dating their Atlantic tenure, released on East West Records.